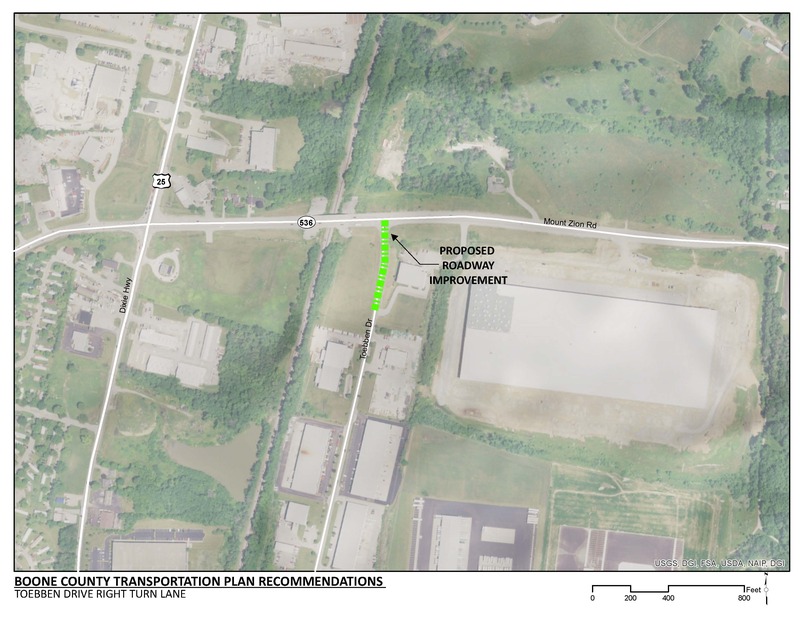 Install a right turn lane on the northbound Toebben Drive approach to the KY 536 intersection to improve capacity at the intersection and support freight. The proposed right turn lane will improve capacity and facilitate right turning movements onto KY 536 (Mount Zion Road). This will provide a temporary improvement to this intersection before implementation of the KY 536 widening project and Toebben Drive extension project recommended in the Boone County Transportation Plan. The existing northbound Toebben Drive approach to the KY 536 intersection is constructed on a fill. A right turn lane will require additional fill and guardrail. Widening to the east may impact the Takatsu parking lot. Coordination with Toebben LTD may be necessary if the parcel to the east is expected to be occupied. There are existing overhead utilities on both sides of Toebben Drive that will likely be impacted by this project. The project may require adjustments to the existing traffic signal to accommodate the new intersection configuration. Existing, two-laned Toebben Drive serves several industrial facilities that generate significant daily truck and employee traffic. However, there is only one access point to KY 536. The KY 536 intersection with US 25 (Dixie Highway) is approximately 1,100 feet west of the KY 536 intersection with Toebben Drive. The westbound KY 536 queue of traffic sometimes extends near or past Toebben Drive. As a result, existing Toebben Drive vehicles must wait through several signal cycles to turn left, creating an additional queue of traffic on Toebben Drive. Vehicles that wish to turn right from Toebben Drive are blocked by the queue of traffic on Toebben Drive that is waiting to turn left onto KY 536. There are several empty parcels within the Toebben Drive development. As these parcels become occupied, the volume of traffic on Toebben Drive will increase and the conditions at the KY 536 intersection will continue to degrade. Toebben Drive serves several existing industrial developments including FedEx Ground and its over 3,000 employees. There are no pedestrian facilities along Toebben Drive. TANK route 22X provides the closest transit service with a stop at the intersection of US 25 and KY 536.